"We've come too far and spent too much to turn back now." That's the RDC's argument-of-last-resort for finishing Beale Street Landing. In the previous post, I tried to put a percentage on the descriptor "too far." One City Council person suggested that over 50% is "too far". I believe he is not alone. Most people think of the halfway mark as a threshold -- since it is the point at which you are getting closer to the end than to the beginning. In my calculation we are actually just reaching the 30% point, provided the steelwork contract hasn't been signed. But is 30% still "too far to turn back?" For many people, yes it is -- but not because they are thinking rationally. It's a classic problem that is discussed in every business school and it has a name: The "sunk cost dilemma." "Sunk costs" are those that have already been incurred and are not recoverable. Large pile of sunk costs at the foot of Beale Street, May 23, 2009. Photo by Michael Cromer. In traditional micro-economic theory, you should not consider sunk costs when you make a decision about a future course of action. They are losses already incurred and have no relevance to the future. To make a strictly rational decision, you should only consider the prospective costs of your various options. The question should not be "How much have we spent? ($11 million.)" The question should only be whether spending $26 million more makes sense, given what we know today. But people have emotional biases. One common bias is people's reluctance to accept the reality of their losses. People would rather proceed (even with a low probability of success) than to quit and have to acknowledge a 100% loss. Therefore, people do consider sunk costs and allow them to influence their decision-making -- even though that kind of thinking is fallacious. The sunk cost fallacy results in too many "zombie" projects (and wars) that never seem to end. How far is too far to turn back? "We've gone too far and spent too much to turn back now." But that begs the question: How far, really, is "too far?" One City Council person told me that he had been going along with this argument, assuming all along that we were "past the halfway mark." But now he says that it appears we may be less than a third of the way -- and that would change his thinking. Presumably, other Council persons might feel the same way. Our best guess is that BSL is now going to cost at least $37.6 million in total. That means BSL as a whole would be about 30% complete (11 divided by 37.6 equals 0.2925), or less than a third, with $26.6 million remaining to be spent. Phase III, the steelwork, would make a major difference, however. If we had gotten to the point of committing to that steelwork contract, itself worth about $17 million, the RDC could then argue that we had reached the 75% mark, rather than just 30% (11 plus 17, divided by 37.6 = 0.7447). You can bet your bottom dollar that the RDC would like to make that 75% argument. Or even the earlier 68% argument (calculated before the price increase). Obviously, the RDC would like very much to get that contract signed. That is why it is critically important for Mayor Wharton to establish whether or not the steelwork contract has actually been signed. Assuming it hasn't, he should order an immediate halt on the project so that the city can preserve all its options and can rationally decide whether and how to proceed. What's it really going to cost? What is Beale Street Landing really going to cost? Good question. Let's try and figure it out. But you can't figure it out by checking the RDC's own website. Go ahead and look for yourself: Not here, not here, not here, nor even on this page. Nowhere is the total cost mentioned. Evidently, they don't want you to focus on that total-cost number. All inquiring Memphis minds should want to know: How far, exactly, have we come? And how far, exactly, do we still have to go? You can't figure it out by looking at the City's Capital Improvements budget (PDF). That's just a rolling, five-year budget plan, not a construction cost ledger. The actual expenditures may not occur in the same year as they are allocated in the budget. And when a project drags on beyond five years, the older years drop off the spreadsheet, without a reconciliation. This project has already run six years, and has at least two more to go. You really can't go by the the number you saw in the Commercial Appeal a couple weeks ago, which was $35 million. It's probably what the RDC told the reporter when he called and asked about it. It came from the RDC, so he had to take their word for it. But when John Branston began citing the RDC's $33 million estimate a few days later, Benny Lendermon dashed off a huffy email clarification to the RDC's board and political friends, claiming Branston was wrong. The total cost, he said was $30.7 million. But Lendermon gave no explanation for why he had recently told the subcommittee $33 million. Which number do we believe? Now we find out that the construction cost is going to be $6.9 million higher than planned. Do the math. It tells us that the total will be somewhere between $37.6 million (if we give Lendermon the benefit of the doubt) and nearly $40 million (if we believe his earlier representations to City Council). What is certain: Mayor Wharton needs to have the RDC's projects independently audited -- before he allows any further work to be done. That's the only way we will know the full and true story. In the meantime, we have rely on our best guesses. $37.6 to $40 million...for a boat dock to nowhere. Why are people still surprised to learn that we’re building a $37-40 million boat dock for riverboat cruises that have long been out of the business? Beale Street Landing, the Riverfront Development Corporation's $30 million project at Beale Street and Riverside Drive, has a serious problem before it even opens. The riverboat cruise business is disappearing. The Majestic America Line steamboat company in Seattle is going out of business. Two years ago, Majestic America acquired the New Orleans-based Delta Steamship Company and three steamboats — the Delta Queen, the American Queen, and the Mississippi Queen — that docked in Memphis en route to Cincinnati, New Orleans, and Baton Rouge. That leaves RiverBarge Excursion Line and its floating barge hotel as the only overnight touring boat on the river. The American Queen, loading passengers and supplies at the Mud Island River Park boat landing, July, 2005. We want to assure our guests that RiverBarge Excursion Lines, Inc. deposits all payments for excursions in a special escrow account at the Whitney National Bank. This escrow account is overseen and regulated by the Federal Maritime Commission. As soon as these funds are made available to us, guest refunds will be processed. RiverBarge Excursions would like to express our gratitude to all guests who have traveled with us in the last 10 years and thank you for your support and for being a part of the RiverBarge Family. 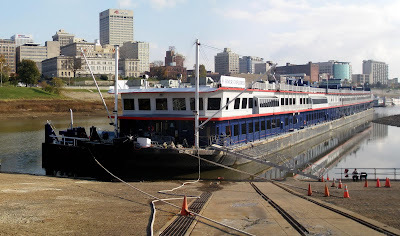 A huge floating hotel, the double-barge River Explorer docks at Mud Island in November, 2007. Photos by Michael Cromer. Because the Beale Street Landing project is under design, the former Delta Steamship Company has increased its dockings in Memphis by 40%. They are trying to build their market here in anticipation of the new docking facility, adding a strong economic development aspect to the project that benefits the City for years to come. Obviously, the RDC hasn't updated their web page in two years. But what if these riverboat companies actually do somehow come back to life? Won't we then need a place for them to dock? Nope. We have a perfectly respectable, and more authentic, riverboat landing at Mud Island -- the one the cruise companies had been using for years. And there's a snack bar and gift shop right nearby! 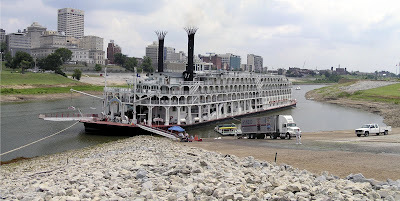 Frommer's: Mississippi Riverboat Cruising Isn't Dead, but It Sure Ain't Healthy, March 25, 2009. Updated December 22 (see below). The RDC's bombshell raises more questions than it answers. We now know that the cost of Phase III of Beale Street Landing -- the steelwork for that unnecessary boat dock and helical ramp -- has gone up by $6.9 million. According to a recent email, reproduced below, from City Administrator TuJuan Stout-Mitchell, the contract for the steelwork was "awarded August 2009". In my opinion, that raises a lot of serious questions and I believe Mayor Wharton and the City Council ought to seek the answers. -- Does "awarded August 2009" mean that Mayor Pro Tem Myron Lowery signed the contract? -- If so, had the RDC advised him in August of the cost overrun of $6.9 million? Did he sign it and commit the City anyway, even though the City Council hadn't yet approved an increased CIP (capital improvements) budget for the project? Was he duped? -- Was the RDC's "Plan B" to take the money away from Phase IV if the CC didn't ultimately approve the increase? Or did they just assume that the City Council would inexorably feel compelled to approve it? -- When exactly were City Council members told? After the contract was signed? Shouldn't they have been told before and given an opportunity to have a voice? The RDC's bottom-line argument for continuing BSL amounts to this: We've gone too far and spent too much to turn back now. But Phase III is a huge portion of the cost ($17 million) and may itself be the tipping point (e.g. halfway). -- What was the urgency to sign in August rather than wait for the new Mayor? Does this award amount to RDC backing the City into going "too far"? Was Lowery deceived into signing this contract? -- Does the City still have the option to cancel this contract? Or at least put a hold on it? Does each day that goes by put the City deeper into the hole, and help foreclose on any other options? People's jobs are at stake (not to mention reputations). In particular, the jobs of RDC officials and even those of the architects' and contractors' who advise and depend on the RDC for work. -- Whether or not Lowery and City Council were deceived, doesn't this go to show that a private-public partnership operating without proper public oversight creates a situation with built-in conflicts of interest? All these questions and more ought to be answered at the first City Council meeting in January. I respectfully suggest to Mayor Wharton that he have his personal staff start finding the answers. I mean personal staff -- and not anyone associated with RDC or with decisions made in the past. Updated December 22, 2009: I've been told that officials of Friends for Our Riverfront asked the City to search for such a contract. I was told that that no such contract could be found, although there is a contractor's number assigned for LCI (the company that was supposedly awarded the job). This suggests the high probability that the contact hasn't been signed yet. "Awarded" would have meant only that the bidder was chosen. If so, then that is very good news. It means that $17 million hasn't been spent yet on the steelwork, and if the project is cancelled then much or all of the cost is still recoverable. That gives the Mayor and City Council more flexibility in considering alternative courses of action. All Federal funds for Beale Street Landing, with the exception of the FY 2009 grant, are included in Phase 3, which was awarded in August 2009. Approximately $800,000 has been expended. The FY 2009 grant is not yet available. No awards have been made on the Cobblestone Restoration and Walkway project. 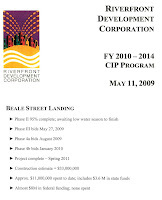 The bombshell news is that the RDC has to go back to City Council for another $8.9 million in order to get Beale Street Landing finished by 2011. If it does not go still higher, the total cost will reportedly be $35 million for what was a $10 million feature in the original Master Plan. A report appeared in this Sunday's Commercial Appeal, on the front page of the Local section. The next day the RDC confessed as much to the public, burying the $9M bombshell several paragraphs down after reminding us once again how much we need BSL to find our way to the river. On Tuesday, John Branston had some choice things to say in the Flyer. On Friday, he had much more to say. On Wednesday, an edited version appeared in the printed edition. In short: Steel prices have gone up, adding $6.9 to the construction cost. The rest of the shortfall, about $2 million, is because they lost some Federal money they had counted on. Frankly, it was a bit of a shock to me. I had taken Benny Lendermon's statement to his own Board of Directors at face value. On June 22 he told them that the bids for Phase III (the steelwork) were coming in at around budget, and that they were pleased. Three months earlier (the March meeting) he had been worried, but now things were just fine. You can listen to the audio of his June 22 report to the Board by clicking here. I'm told by someone in City government that the bombshell news had already gotten around to the Mayor and the City Council by the time the CA article was published, which apparently forced the RDC to go public with it. If Mr. Lendermon was being truthful to his Board in June, then the steel prices have jumped within the last five months or less. Presumably, the RDC hadn't protected itself against inflation in the contract they wrote less than five months ago. Something went wrong, but it clearly wasn't Katrina. This project has major flaws, and has had them nearly from the start. I have been kicking myself for not having come out in strong opposition long ago. My excuse is that the full and true picture didn't really become clear until the RDC showed us their Cobblestones plan in early 2008. That's when I started my Web site. I suspect that the RDC's holding back the Cobblestones plan until BSL was locked in was very deliberate -- a key element in their bait-and-switch strategy. What finally became clear: In the RDC's eyes, BSL was intended to replace, not just enhance, the historic Cobblestone Landing. This viewpoint was directly contrary to the RDC's 2002 Riverfront Master Plan, and the change in direction was never made very clear to previous City Councils. And when the land bridge was cancelled and the City wouldn't take the Promenade by eminent domain, Beale Street Landing was all the RDC had left to build. After January 2006, BSL was no longer "just" an RDC project. It was do-or-die. But the good news is this: Here is a opportunity for the City Council, the new Mayor, and the Memphis public to take a fresh look at the situation and devise a new plan, before the RDC digs the City into an even deeper hole between Tom Lee and the Cobblestones. My recommendation: Stop the Beale Street Landing project immediately. Spend a couple million dollars cleaning up the mess and re-sodding. And then -- without the pressure of RDC officials coming hat-in-hand, spinning up a storm -- we can all take some time to rethink the process for managing and improving our riverfront. Ten years of nothing ought to tell us something: The current process doesn't work.